In ancient Japan, a rural village is under siege from a gang of bandits who repeatedly return to steal their crops and leave the inhabitants teetering on the brink of starvation. Unable to defend themselves, they turn to the samurai. These warriors-for-hire are almost as feared as the bandits themselves, but represent the villagers’ only hope of a better future. 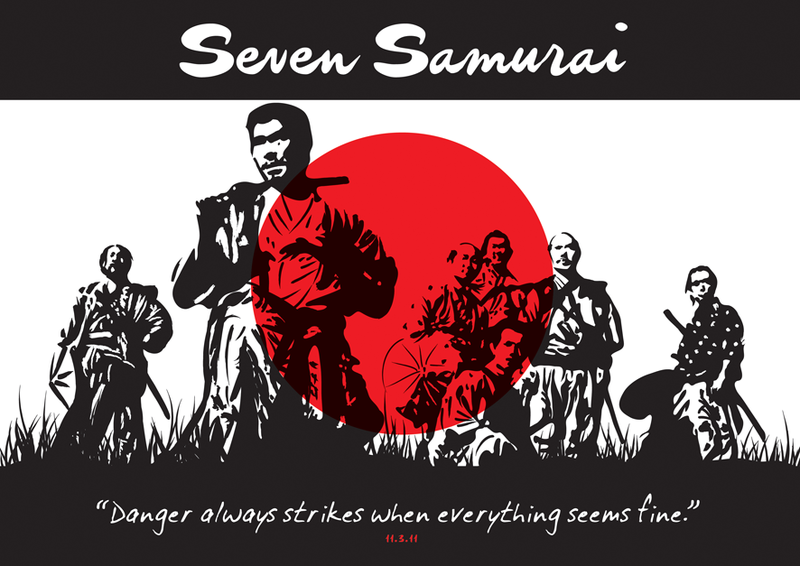 Seven Samurai is a huge, sprawling movie – neatly divided by an intermission. The first act concerns itself with bringing together the warriors themselves. It’s a process beset by difficulties – not least the villagers’ inability to pay anything more than three meals a day in return for the warriors’ services. But, the job of samurai implies a certain level of honour and nobility, and as such, the group are forged. Once assembled, the second act sees the samurai training the townsfolk and fortifying the village before the inevitable attack – and subsequent battle. There’s an awful lot going on in the film, which explores the social traditions of ancient Japan, the caste and feudal systems and the historic role of the samurai. There’s even a romantic subplot. But for a more casual viewer, there’s still much to be admired in the masterful way Kurosawa realises his vision. Despite the appearance of dozens of characters, each is distinct and developed. Wise master Kambei (Takashi Shimura) is a grizzled veteran of enormous calm and gravitas. Early in proceedings he reveals his skill for strategy by disguising himself as a priest (shaving his head in the process) and saving a young hostage from his kidnapper. He spends the rest of the movie contemplatively rubbing his cropped hair whenever his mental faculties are called upon. At the other end of the spectrum, Kikuchiyo (Toshiro Mifune) is a rambunctious character who acts on impulse and plays to the crowd (not least in his dealings with an untameable horse), although he is fiercely brave and, ultimately, a true inspiration. The siege on the village is staged brilliantly, with Kambei’s plans explained lucidly as he walks the other samurai around the village, pointing out points of strength and weakness on a map. As the bandits approach, the audience is already aware of how the village will defend itself which, far from spoiling the surprise, lends a real air of ‘us versus them’ to proceedings. Despite its length, the huge array of characters and the labyrinthine plot, Seven Samurai remains readily accessible and visually stunning, with some beautifully composed shots and superbly constructed set-pieces. 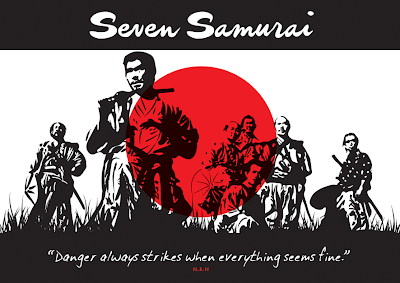 The print has not aged well, and some of the conventions of Japanese society are a little mysterious, but allowing that to deter you would be absurd: Seven Samurai is not considered a classic for nothing. Thanks for that, Ward. I will dl this evening. Sounds right up my street.